In another setback, Elk Grove Mayor Steve Ly was unable to muster any support from his three City Council colleagues in his nomination to fill a vacancy on the Elk Grove Planning Commission. This most recent stumble by Ly happened at the Wednesday, January 25 City Council meeting. As mayor, Ly is entitled to nominate appointees to the city's various commissions and committees, but final appointment is made by a consensus of the City Council. Although most appointments to the various commissions are not controversial and usually granted, a Planning Commission appointment is a politically coveted position. 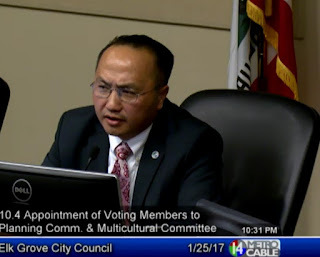 Ly's nominee to replace outgoing Commissioner Sparky Harris was Marlon Hill, who unsuccessfully challenged Elk Grove Unified School District Trustees Nancy Chaires Espinoza for her chair in November. Among Hill's biggest supporters in that race were Ly and former Elk Grove Mayor Gary Davis. During deliberations, the four councilmen agreed that the appointee should be from District 4. Councilmen Steve Detrick and Darren Suen said they supported Nayar Sarfarez, but Ly did not nominate him. In nominating Hill, Ly said given that Harris is African-American, it would be appropriate to appoint Hill, who is also African-American. "What I also look for is the person leaving the planning commission, I do acknowledge that he is African-American, I am interested in that diversity as well," Ly said. Ly then nominated Hill, which was followed by a long silence. "Mayor, I don't hear a second, do you have another person," Detrick asked. After nominating and appointing Rev. Raymond Hess to the Multi Cultural Committee, the Council came back to the Planning Commission with Councilman Pat Hume suggesting Mackenzie Wieser. Ly said he met with Wieser and agreed that she was qualified, but continue to advocate for Hill saying that he was active in the African-American community and "that is something that is important to me." After it became apparent that Detrick and Suen favored Wieser, Ly abandoned Hill and reversed track saying that Wieser was well qualified. "I'm prepared to nominate Mackenzie," Ly concluded. The council voted 4-0 for the nomination. Wieser is expected to be sworn-in at the next Planning Commission meeting.